Apple is widely expected to launch a smaller version of the iPad later on Tuesday, into what is becoming an increasingly crowded tablet market. The launch will be watched by fans keen for a cheaper device while detractors will see it as another test for chief executive Tim Cook. 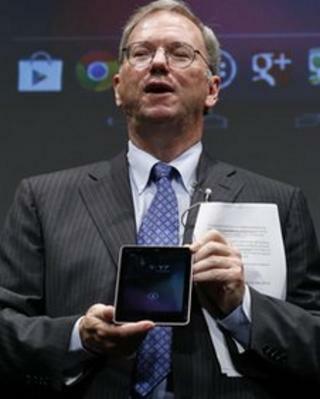 Demand for smaller tablets have been proved by the success of Amazon's Kindle and Google's Nexus 7. The event in San Jose, US, kicks off at 10:00 local time (17:00 GMT). Most analysts agree that the price of the pocket-sized iPad will be key to its success. Currently Apple's 9.7in iPad 3 has a starting price of $499 (£399 in the UK) while its iPad 2 can be bought for $399 (£329). To date, Apple has sold more than 84 million iPads, with the device accounting for 26% of Apple's third quarter revenue. The new mini iPad is expected to shave a couple of inches from its larger cousin with analysts predicting a "sweet spot" price of about £200. That would make it an "affordable Christmas present", said Maciej Gornicki, an analyst at IDC. The risk for Apple, said Ovum analyst Adam Leach, will be cannibalising its existing iPad range. "If an iPad customer wants to upgrade will they still go high end?" he asked. A survey of 1,000 consumers by US firm Baird Equity Research suggested that, on average, consumers would be prepared to pay $242 (£150) for a 7in iPad and $268 (£167) for an 8in model. Amazon's new 7in Kindle Fire HD costs $199 (£129 in the UK). A slightly larger version, shipping on November 20, will sell for $299 (£159). Google's Nexus 7 has a price tag of $250 (£159). The launch of the mini iPad will be keenly watched by Apple critics who have questioned whether the firm has lost its edge since the death of Steve Jobs. The fact that, unlike previous product launches, there is little doubt about what is coming could be significant, thinks Mr Leach. "It represents a change in the way Apple go to market and the way people perceive Apple. It is a move away from how Steve Jobs did things. It is being headed, dare I say it, more like a normal technology company," he said. Two years ago when mini tablets began to hit the market, Steve Jobs famously said that in his opinion they would not succeed because the size was insufficient to "create great tablet apps". That Apple has changed its mind represents another important "sea change" for the company, thinks Mr Leach. "Apple is now in the role of following what the market is doing, responding to the threat of the Google Nexus and the Kindle Fire," he said. While internally Apple may be regretting losing its image as a market leader, it could be good news for consumers, thinks Paddy Smith, editor of Stuff.tv. "Having buckled under public pressure to increase the size of the iPhone's screen, Apple can now be seen once again creating a product based on listening to its customers, rather than thinking it always knows best. "We think a smaller iPad - with a lower price tag - is a sure-fire Christmas hit. And Apple knows it, too," he said. Boosted by its new iPad, Apple will continue to dominate the tablet market, predicts IDC. It said that Apple will hold a 68% share of the market in 2012, compared to 29% for Android tablets.